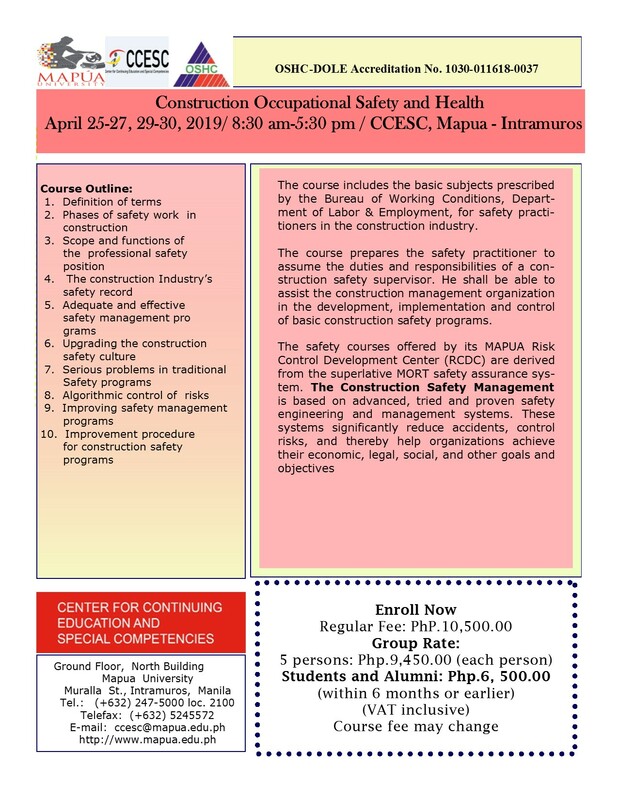 The Center for Continuing Education and Special Competencies (CCESC) together with the Department of Labor and Employment - Occupational Safety and Health Center (DOLE-OSHC) offers the Construction Occupational Safety and Health training on April 25 - 27 and April 29 - 30 from 8:30 AM to 5:30 PM at the CCESC Training Room, Mapúa Intramuros. The training focuses on the advanced, tried, and proven safety engineering and management systems. For inquiries, contact the CCESC office at (+632) 247-5000 loc. 2100 or (+632) 524-5572.